Released in a limited edition of 500 letterpress sleeves, handmade by Michael Babcock of Interrobang Letterpress. VPRO Radio is most internationally known for their Mort Aux Vaches series and Brainwashed is honored to be blessed with the second release of the year produced live at VPRO Radio by the generous Berry Kammer and Maurice Woestenburg. The One Ensemble of Daniel Padden became the working name for Daniel Padden's extracurricular solo activities outside of Volcano the Bear. Two albums surfaced through Catsup Plate (US) and Textile (FR) almost completely recorded by multitalented multi-instrumentalisy Daniel Padden, himself. Following the two releases Padden assembled an actual ensemble and has played numerous concerts and fests around Europe. As a close and personal friend, Daniel Padden sent me the CD of the radio session. I was completely blown away at how incredible his band had transformed his songs into something so complete and fully realized. As many of the songs are older, they won't be recorded for the next album. I didn't want these recordings to go unheard or unnoticed. 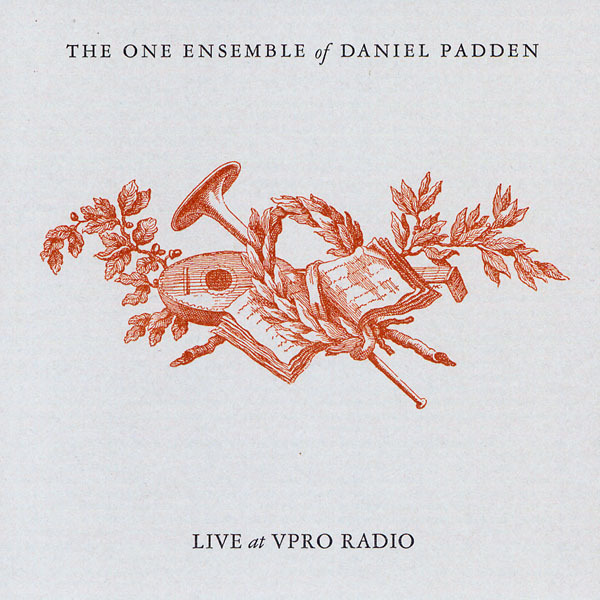 Live at VPRO Radio perfectly captures an amazing ensemble in the studio, and in a world which praises a lot of "new folk," there's something to be said for musicians who are incredibly talented and led by a fantastic composer and arranger like Daniel Padden. The music is stellar with the instrumentation of drums, vocals, guitar, cello, viola, and bouzouki, challenging the dogmas of western songcraft while never losing its step and falling down the beaten path of clumsy noisemaking or music school acrobatics. Like the Windy & Carl CD, "Dedications to Flea," this one is letterpressed in a limited edition of 500 copies by Michael Babcock of Interrobang (Isis, Converge, Hydra Head) and the music is so fantastic that I anticipate it will sell out just as quickly. Volcano the Bear member Daniel Fadden's latest venture under his own flag enters the world via a limited edition (500) CD-R from the esteemed Brainwashed organisation (visited regularly by this writer for their fabulously Byzantine discographies of acts like Current 93, Coil and Nurse With Wound). It also comes housed in a marvellous letterpress card sleeve, reminiscent of the packaging of the Independent Projects label, which is all to the good, and places the listener in a receptive head space for band versions of Daniel's multi-faceted, multi-instrumental work. For here, Daniel's solo compositions are realised by a five piece ensemble: Chris Hladowski on bouzouki, Alex Neilson on drums and percussion, Peter Nicholson on cello, Aby Vulliamy on viola, and Daniel his own self on guitar and voice. It's clear from the outset that the ensemble approach and looseness of the live-to-radio format suit Padden's work very well. The overall feel is antiquarian, reminding one of everything from the soundtracks composed for Fassbinder by Peer Rabin, to various Greek, Eastern European and Middle Eastern traditions (and there are echoes of the work done by Magic Carpathians on similar foundations) and indeed deconstructed classical chamber music. 'Clown Flinging' begins and ends with nerve-jangling bowing, but coalesces into free-wheeling gypsy folk in between. The bouzouki-powered 'Mustard Mustard' is infused with the smoke of a thousand North African souks - one gets totally immersed in its celebratory, dervish swirl only to have the rug-seller pull his wares out from under you as the piece falls apart into a dizzying profusion of bowed dementia. 'Baltic Antiquarian' wears its roots partly on it sleeve, but the ensemble travels down a vector to the outer rim of sanity by virtue of Padden's pushing the envelope of his fractured Robert Wyatt vocal stylings. These will not be to everyone's taste, but suit the material here perfectly. On 'Norway Sleeps Norway', Padden's voice is more likely to please folk purists, but he's earned the right to be taken on his own terms. It's an astonishing track - a divinely memorable sea shanty suitable as much for plying interstellar trading routes as it is for traversing the oceans of Terra. 'Weevils' has the tortured soul of the best Rembetika - all it needs is the fisherman's cap and worry beads to accompany its ouzo-soaked waltz, Typical of many of the tracks on this release, it builds up a head of steam only to fall apart and then be reconstructed piece by piece. In a sense, it's a very Brechtian technique, drawing the audience in, then forcing it to analyse what is being performed by laying bare its circuitry for scrutiny. Remaining tracks 'The Tumble Waltz' and 'Farewell You Porcupine' (ha!) consolidate a superbly realised set, which achieves a level of virtuosity and creativity that few artists would match given unlimited studio time. One has to constantly remind oneself that it's a live radio broadcast. Listening to Padden's 'Live at VPRO Radio', it's difficult to take some of the other material flying under the free folk banner as seriously as one is clearly meant to. Like the Windy & Carl release before it on this label, copies will not last, so you know what you have to do. - Tony Dale, Terrascope. With a distinctive instrumental configuration of bouzouki, violin, cello, drums, and guitar, The One Ensemble of Daniel Padden mines a similar kind of 'nuevo folk' territory to A Silver Mt. Zion and A Hawk and a Hacksaw. Having originated the One Ensemble as a moonlighting project from his Volcano The Bear day job, multi-instrumentalist Padden produced two albums alone before assembling a touring group for European concerts and festivals, and it's this outfit that was captured live in the studio for the radio session.